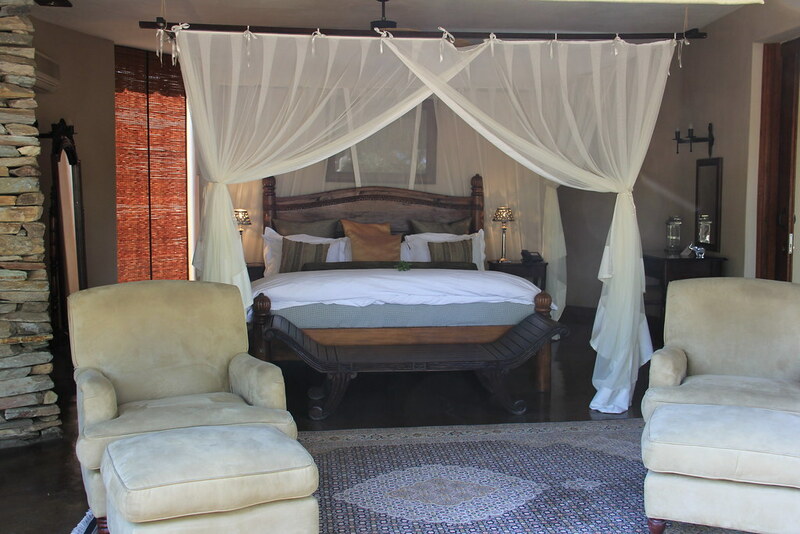 Situated on the Private Manyeleti Game Reserve concession within the Greater Kruger National Park in Mpumalanga you will find the jewel in the Tintswalo crown, the 5-star Tintswalo Safari Lodge. 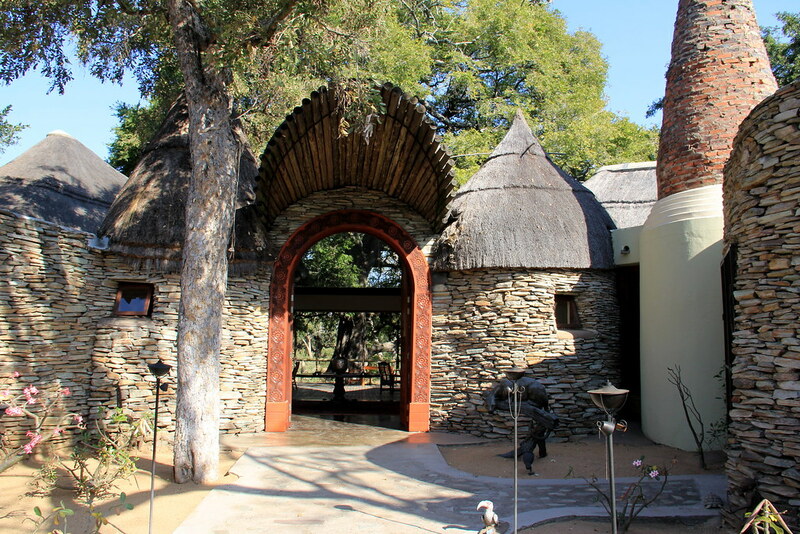 Initially built as a family hideaway, which also acted as their accommodation while Tintswalo Safari Lodge was being built, the owners soon realised that The Manor House is too good not to share and was an ideal ‘villa’ accommodation for families and small groups, hence it was converted. When building Tintswalo Safari Lodge, with the input of their stylish daughter, six elegant and tastefully decorated suites and one opulent Presidential suite came to life, each echoing the bygone era of the nineteenth century explorers they are named after. Your preference might be biased on the explorer you hold dear; we had the fortitude to experience two different accommodation options – the Speke suite and the Presidential suite. An untamed stretch of road takes you to the entrance of Tintswalo Safari Lodge, where it is not uncommon to spot the occasional animal grazing on your journey. We catch a glimpse of two giraffe feeding on the leaves of a tree. We realise that we are already amongst the animals as the reserve is unfenced, so you might think you are on your own private ‘game drive’. It is imperative to realise that you are entering the habitat of wild animals, so for your own safety, stay in your vehicle with the windows closed. We are met at reception by Ronel, our gracious host, who hands us each a warm refresher towel. 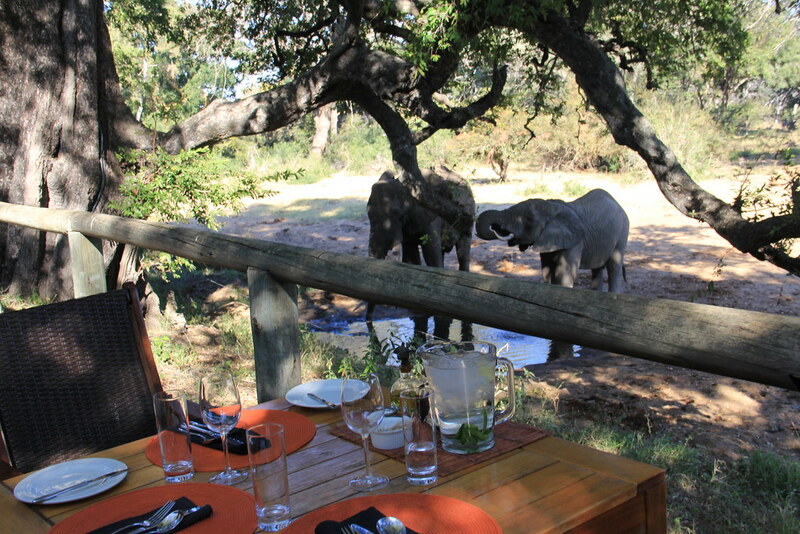 Arriving just in time for lunch, we are awe-struck by our vista of elephants sashaying towards the watering hole while we feast on lunch. They have come to fill up their trunks and do so much to the amusement of the dining guests. A few naughty monkeys vacate a tree in an opportunistic pounce on a vacant table to pilfer whatever leftovers there might be. 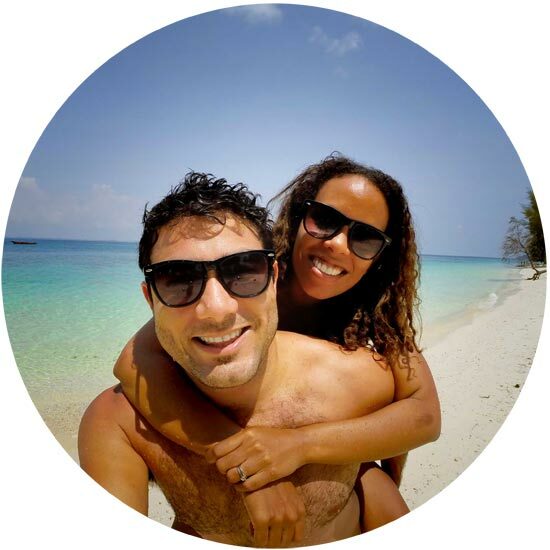 Ronel escorts us to our Explorer suite and we traverse on an elevated wooden walkway. 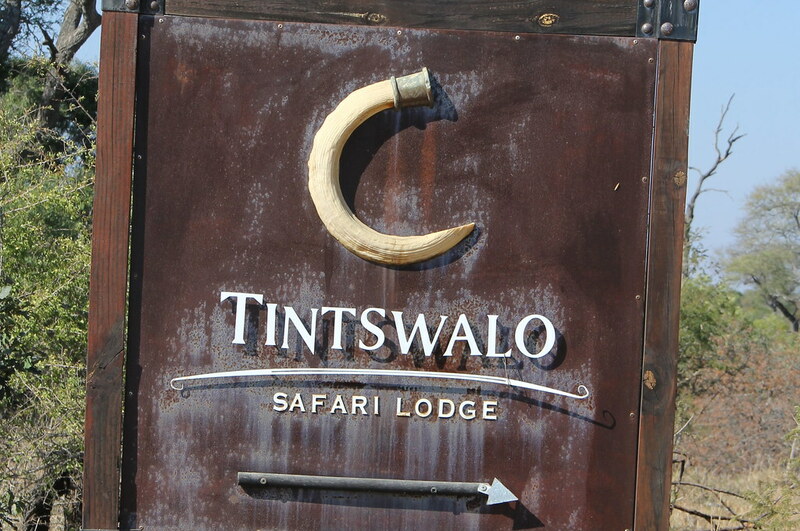 The winding pathways make you realise that the minimal amount of disturbance was caused to nature when building Tintswalo Safari Lodge; everything blends together seamlessly. 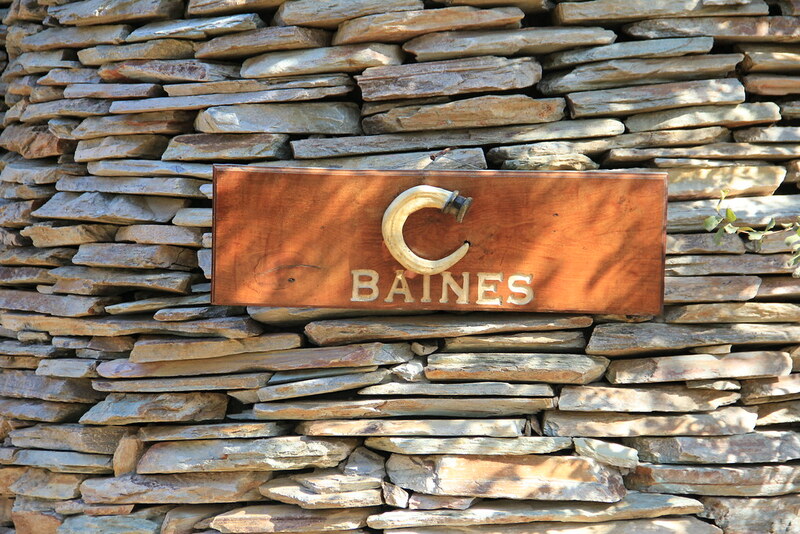 We enter our Speke suite and I am taken back to a century where no expense was spared to create a visual masterpiece. The dark wooden furnishings are expertly chosen to contrast the white linen. Splashes of earthy tones, creams and greens let the outside in. I love the dressing area behind the wall partitioning the bedroom section – no suitcases, strewn clothes or clutter of any kind to detract from this haven of tranquillity and luxury. The bathroom provides its own sanctuary – a free-standing Victorian bath with draped curtains allows you a view of the bush. The double vanities, indoor and outdoor shower perfect the picture. 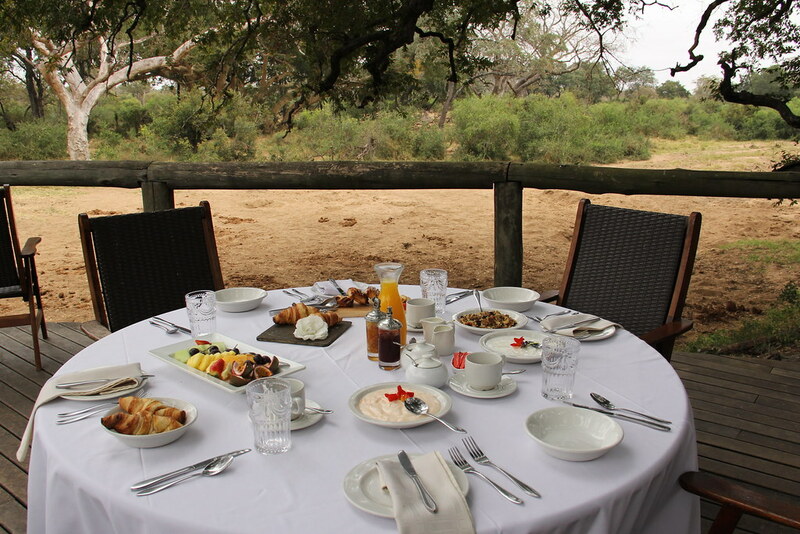 Stepping out onto your wooden deck veranda you realise you are in Africa – the rustling of leaves and snapping of branches can only mean one thing – the elephants are grazing a few metres away. Their only deterrent is a fence which keeps them from emptying your pool. 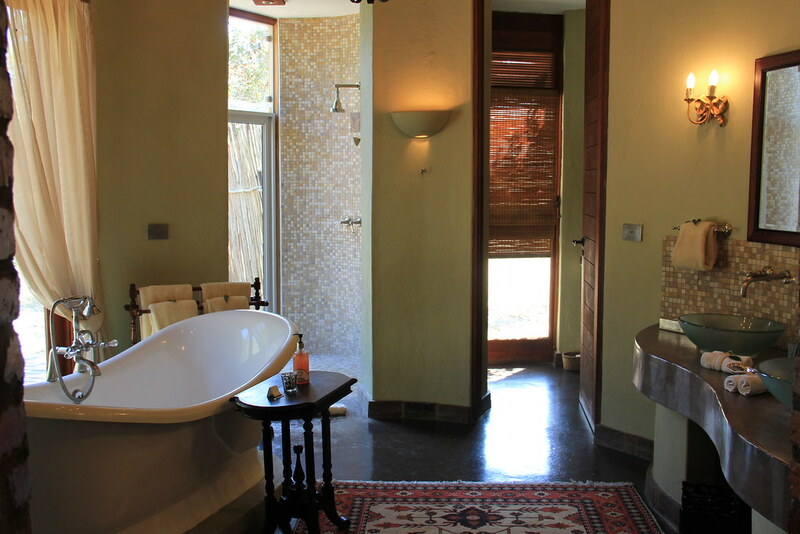 Did I mention that each suite comes with its very own plunge pool? A perfect antidote to those blistering summer days. The time has come for our first game drive. 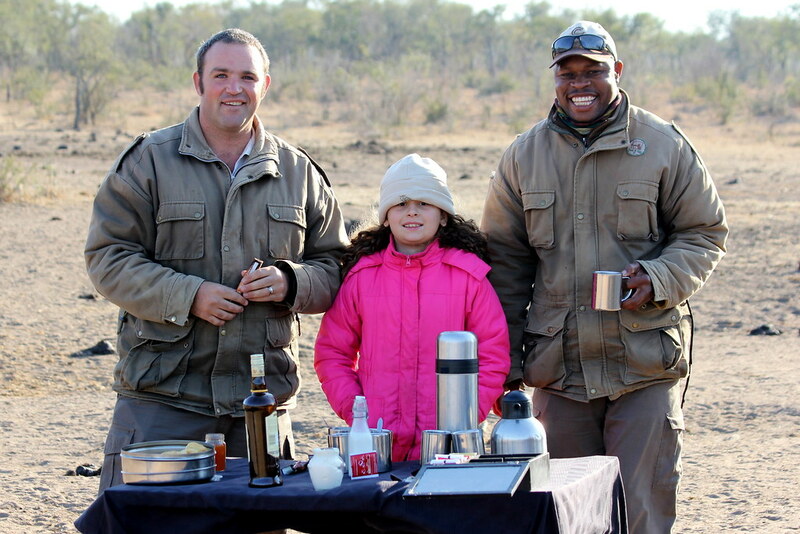 Ranger Darren explains all the dos and don’ts to us while tracker Eric listens with an amused expression on his face. The rapport between Darren and Eric works like a well-oiled machine and lots of comic quips is what makes them a formidable team. 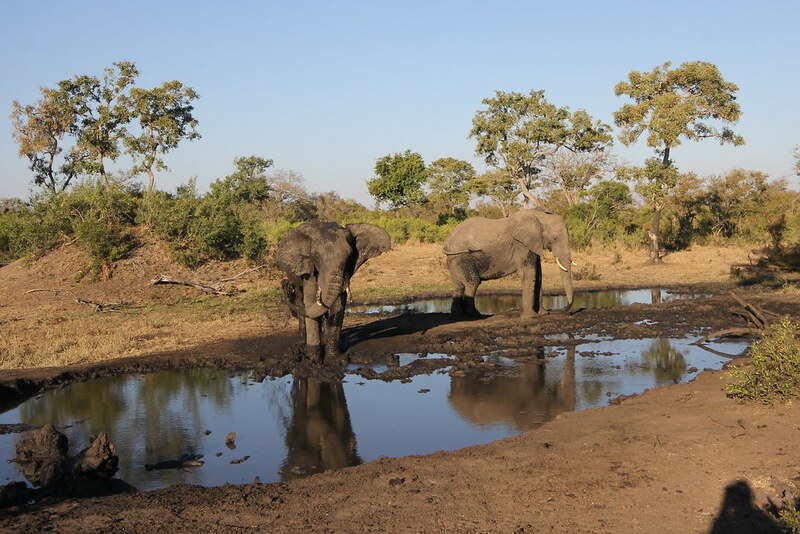 Two elephants are making their way towards a muddy watering hole. After a drinking bout, the one starts his own cooling process, spraying himself with mud. Along the way, Darren had dropped Eric off in the middle of the bush, telling him to find animal tracks and report back what he had stumbled upon. The sun has set and we wonder out loud if Eric is ok or whether he has become dinner. As we turn the corner, we are met with the most majestic setting of a picnic in the bush. 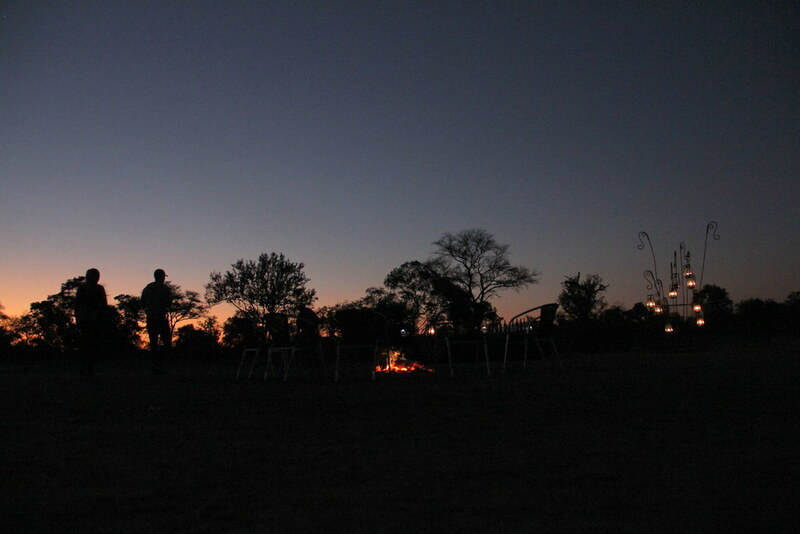 A crackling fire, a braai, an open bar, lots of snacks, chairs to sit on and lanterns hung from a tree add to the ambience. Plus we found Eric! After dinner, we are escorted to our suite by security. 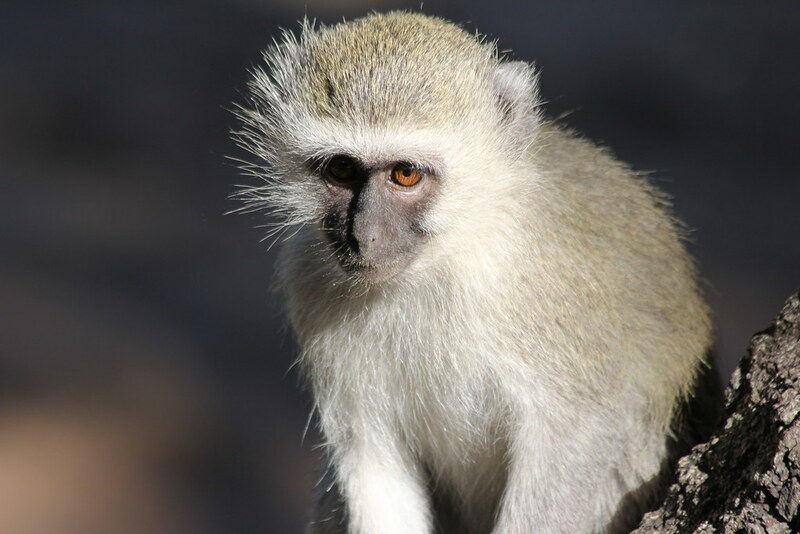 Nocturnal creatures have been seen in the past and Tintswalo Safari Lodge prides themselves that the security of their guests is one of their top priorities. 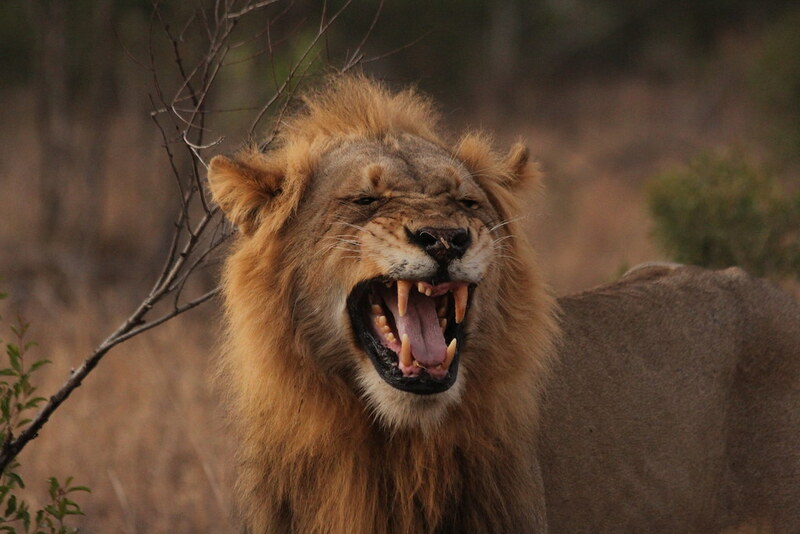 Weary from lack of sleep – I awoke from the thunderous sounds of lions roaring, or was it my husband snoring? 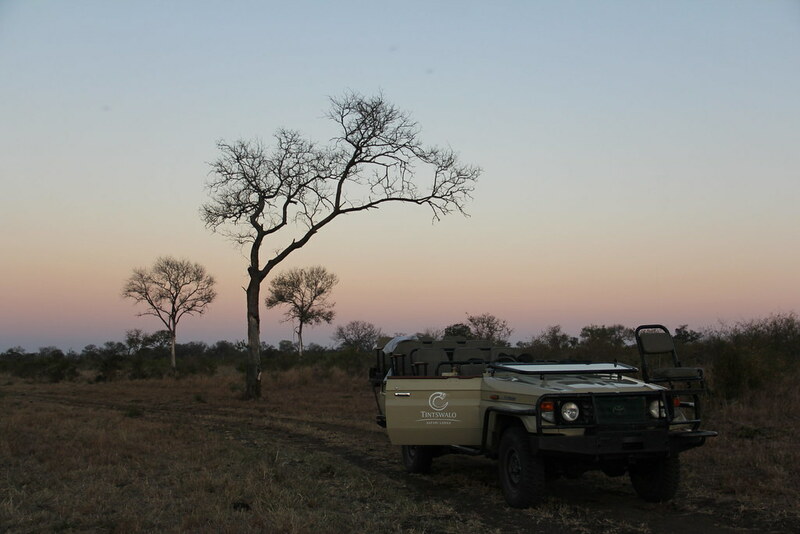 I grab a cup of coffee and a rusk before Darren rounds us up for our early morning game drive. 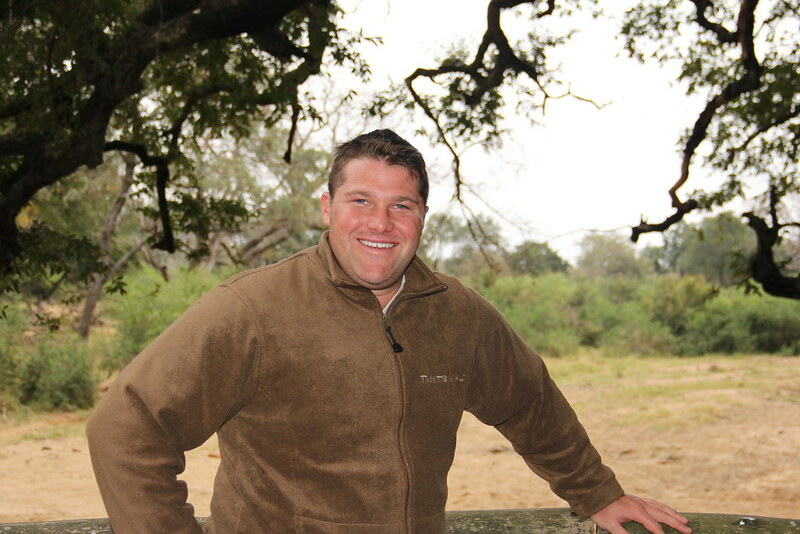 A new lion coalition, the Birmingham Pride has made their home on Tintswalo Safari Lodge and Darren heeds the call of the wild. A deep trembling roar articulates its way upwind and then he comes into view – his flehmen grimace contorting his face. The Thanda male is testing the surrounding area to ascertain which scent markings were left and has found some female gland secretions. 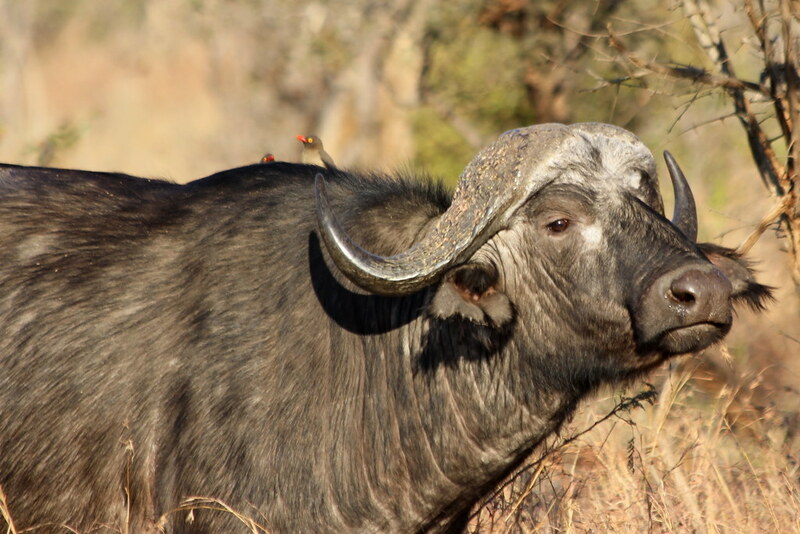 This ‘taste test’ pinpoints whether the female is in oestrus and ready to bear his offspring. Darren hears the unmistakable sounds of ‘love’ – a mating pair of lions in a scuffle. We get there just too late; it is over within a minute. The ‘honeymoon’ lasts for three days where these felines mate in 15-minute intervals. 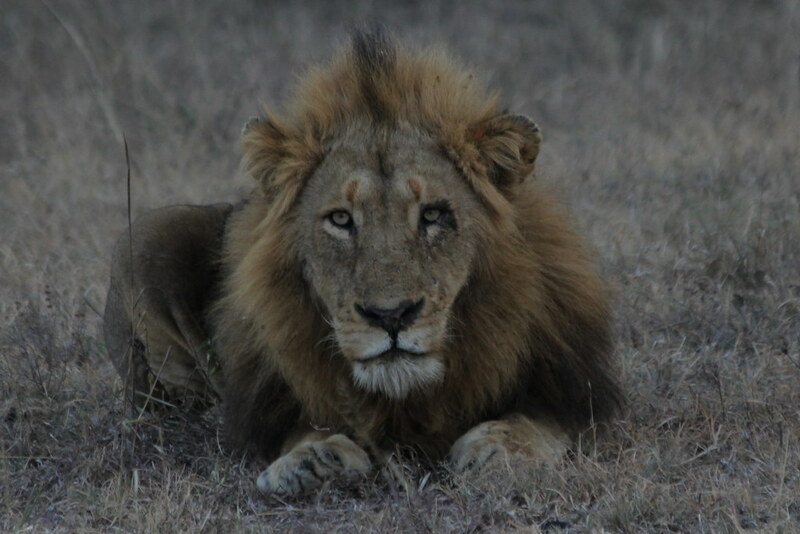 Not being the friendliest of interactions, the lion had a black eye, probably from some overzealous behaviour which the female didn’t take too kindly to. We head east, where a herd of buffalo is grazing. The herd is dotted with calves, testament that it is and has been mating season all round! Our coffee stop is on the banks of a dam where a lone hippo pops up to make his presence known. Coffee, tea, hot chocolate, Amarula coffee and fresh scones with jam are served. 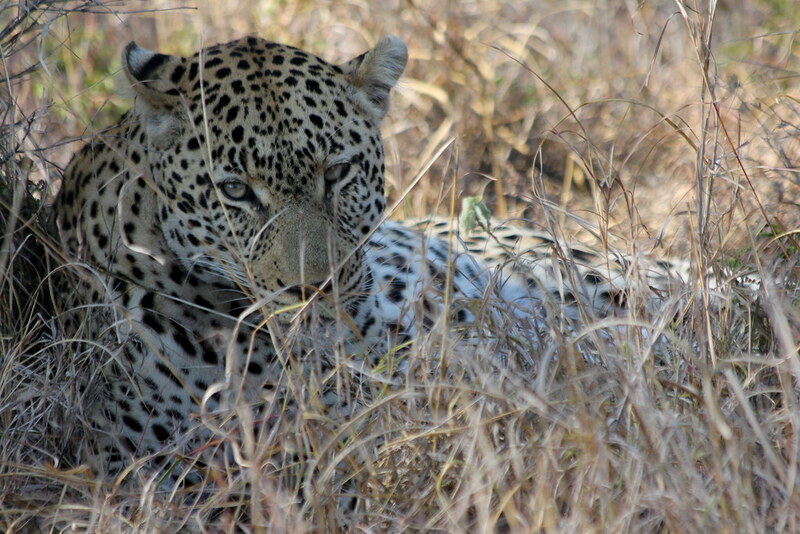 We get notified that there is a leopard sighting and we rush to get to Buffalo plains. This breathtakingly beautiful creature is named Rhulani, which means peace. He has a very relaxed demeanour despite the surrounding vehicles and people gasping at the sight of his magnificence. Stomachs rumbling, we head back to tuck into a mouthwatering selection of pastries, fruit and breakfast prepared just the way you like it. Ronel informs us that we can now move from Speke to the Presidential suite. 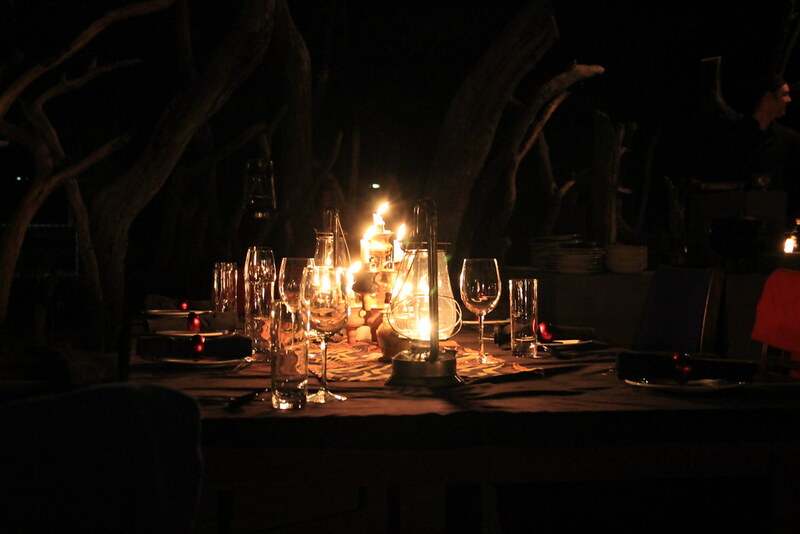 Our excitement evident, we conclude our meal and make our way on foot to our new lodgings. Ronel opens the front door and it takes me a few moments to drink in this three-room grandiose ostentatious magnificent luxurious pied-a-terre. I am fresh out of superlatives. 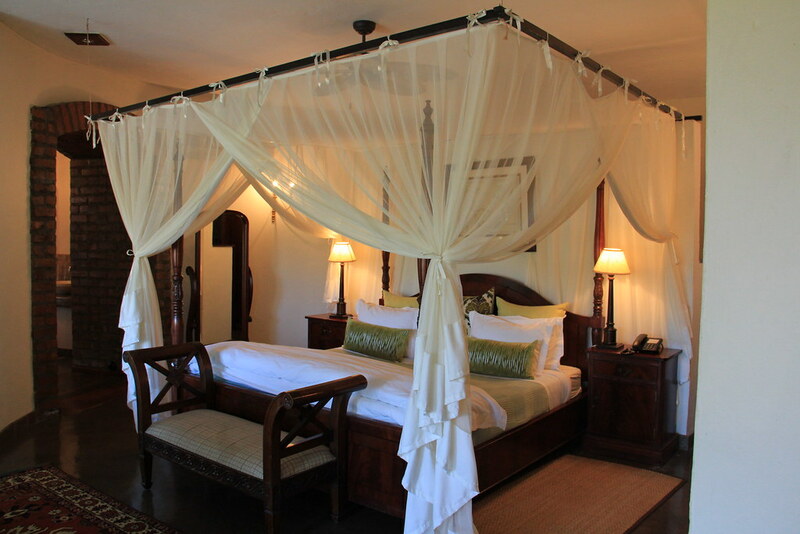 The Presidential suite is matchless in offerings: its price tag comes with two fully furnished en-suite bedrooms, a lounge and dining area, a fully stocked kitchen, a veranda with a plunge pool plus your own chef and ranger team. The outside temperature has reached the mid-twenties. Welcome to winter in the bush. 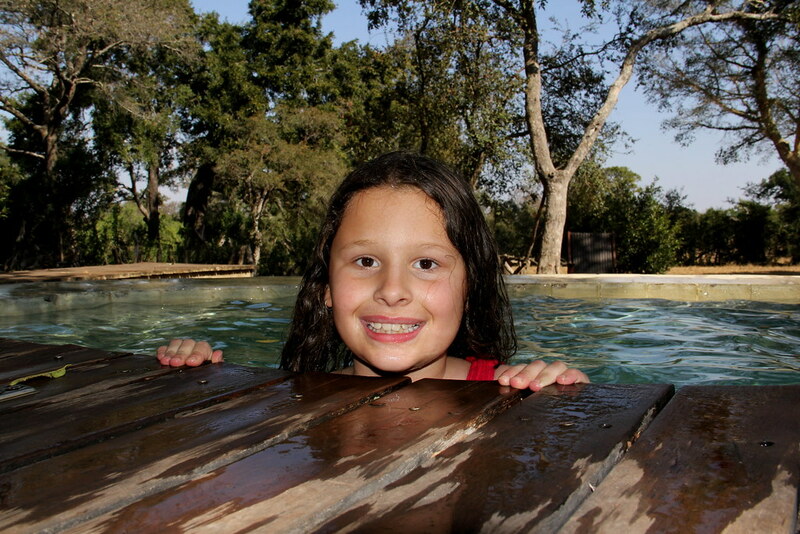 My daughter decides it’s time to try out the plunge pool. 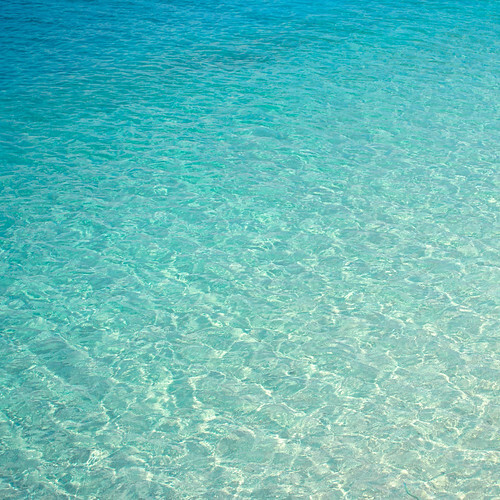 The water isn’t heated and the only form of warmth to heat up the surface is the rays of the sun. I have to really twist my husband and daughter’s arm to go on the evening game drive. It is so relaxing in our suite that nobody wants to venture out, but when it comes to animals, I have a serious case of FOMO (fear of missing out). Back at the main lodge, we are treated to a BOMA dinner, where the Tintswalo Choir entertain us. The dishes at Tintswalo Safari Lodge always come with a South-African twist. Imagine bobotie, malva pudding and potjiekos. At 06:30 there is a knock on our door. My husband and I are raring to go, but our daughter is not quite ready yet. Enter Alistair, ranger of note with a plethora of knowledge about all things bush-related. 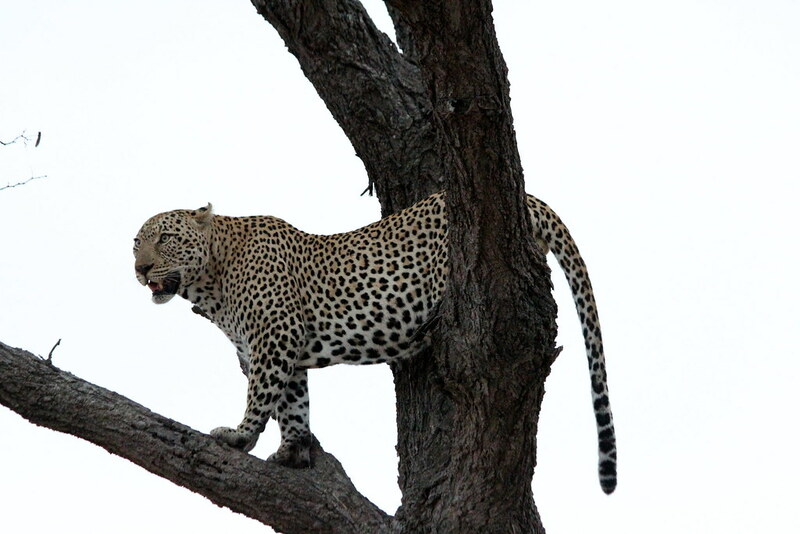 To expedite our exit from our suite he announces “They’ve found two leopards! Let’s go!” We all scramble to get to the vehicle; tracker Julius is already waiting in prime position. We wait. 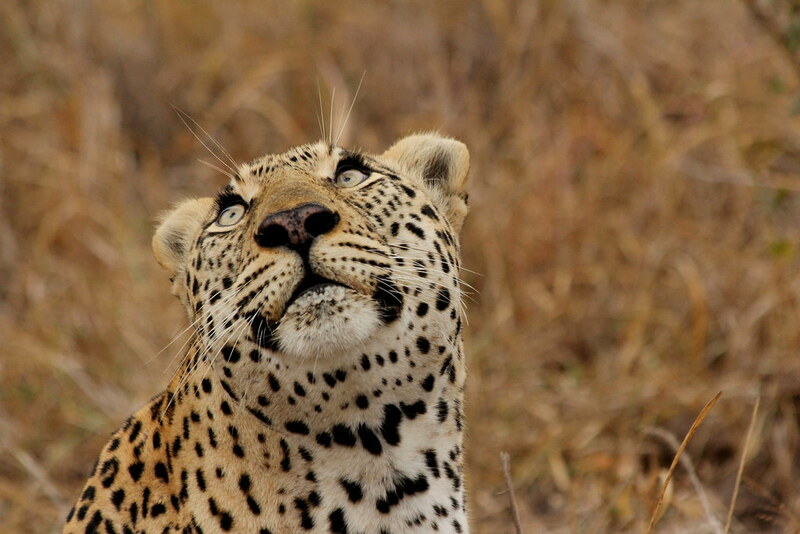 Rhulani glances upwards. He takes aim. There he goes, sinking his claws into the bark, scaling it in an impressive and effortless way. I have never seen the display of such elegance in a leopard. He pauses on the branch. It is a cloudy morning and the white backdrop makes it look like Rhulani has come in for a studio shoot. 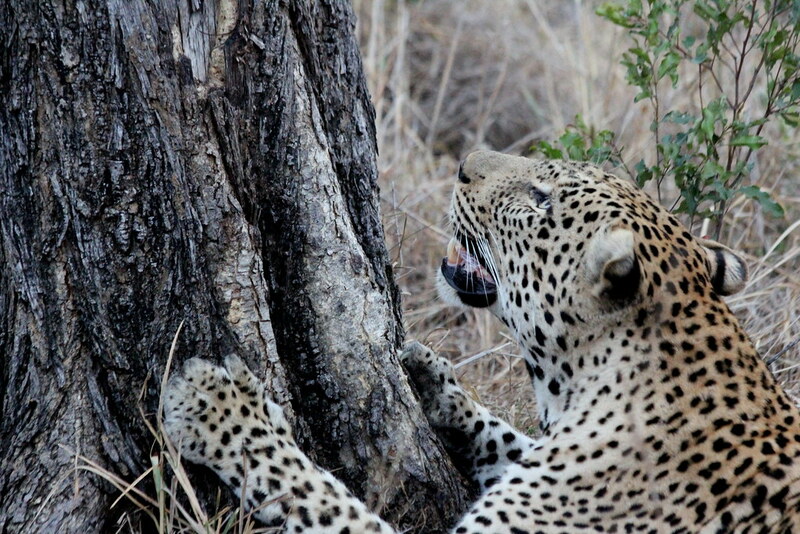 He stealthily approaches the remnants of his meal, which now resembles a big piece of biltong suspended from the tree. Here he comes, bringing it down! He starts removing the hair off his prey and feasts on the unidentifiable morsels of what we think used to be an impala. What will haunt me about this incredibly beautiful animal for the rest of my life was the sight of his glistening green eyes looking upwards to see if there is something present in the tree. Those lashes! Wow! “Would you like to stay with Rhulani or see other animals?” Alistair asks. “Stay with Rhunali”! we answer in a choir of glee. The leopard gets up and starts walking. We follow him through some almost un-manoeuvrable terrain. He might be going for a drink we are told. On his way to the watering hole, he spots a warthog, which he unsuccessfully stalks. 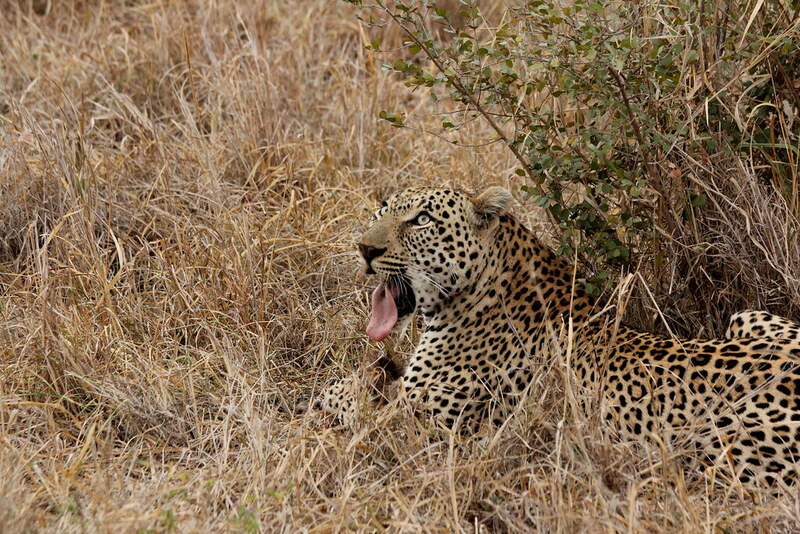 He also encounters a herd of impala but doesn’t manage to catch one. Tired from the adulation of his audience, he deposits himself under a tree to rest. He looks me straight in the eye and lets out a snarl. Perhaps he sensed he was my one bucket list animal to see in the wild. At least I didn’t become his next meal. Thank you to Nicky Arthur PR for arranging our stay at Tintswalo Safari Lodge. As always the views expressed are the author’s own. On a recent trip to the bush, I got bitten by the ‘bush-bug’, an absolute life-altering experience. I now long for the expanse of wide open spaces, a pollution-free sky and the roar of a lion lulling me to sleep. When I’m not fantasising about my next leopard sighting, I thrive on taking photographs of my family and love capturing the beauty of sunrises, sunsets, rainbows and the magnificence of the full moon. A wife and doting mother, my city-life day is filled with driving my daughter to her next extramural activity.